After the two Williams-Mercedes led early on in the British GP, the skies opened up and the rain fell, Lewis Hamilton pitted at just the right time for intermediate tyres and won the British GP ahead of his team mate Rosberg in second place, 10.9 seconds behind and Sebastian Vettel in the Ferrari in third place, 25.4 seconds behind Hamilton. 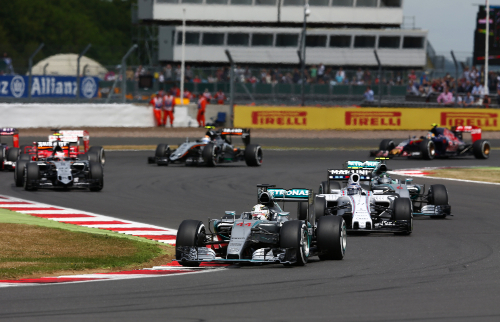 The win is Hamiltons third British GP win and his fifth win of this season, and 38th victory of his career. It was Mercedes GPs 8th win in nine races. Felipe Massa (36.8s)in the Williams-Mercedes was fourth, followed by his team mate Valtteri Bottas (63.1s) in fifth, Daniil Kvyat (63.9s) in the Red Bull-Renault in sixth, Nico Hulkenberg (78.7s) in the Force India-Mercedes was seventh, Kimi Raikkonen (1 Lap) in the Ferrari was eighth, Sergio Perez in the second Force India was ninth and Fernando Alonso in the McLaren-Honda scored his first point finish of the season in tenth. Before the start Felipe Nasr will not start the race after a mechanical problem puts the young Brazilian out. The grid clears and the field comes round to the start. The lights go out and the race begins. Massa get a jump around the Mercedes of Hamilton and Rosberg - Massa gets the lead, Bottas jumps to third behind Hamilton, Rosberg in fourth. Jenson Button ends up in the gravel trap. Romain Grosjean is out, Maldonado and Alonso get mixed up in the damage, as well as Maldonado. The safety car is deployed and the field slows down. Alonso pits for a new front wing. On lap 3 the lights go out and the race begins again. Hamilton is agressive and tries to get past Massa in the lead, but locks up - Bottas takes second place. Kvyat passes Vettel for seventh. Verstappen spins off into the gravel trap - his day is done. On lap 6 Williams runs one-two with Massa and Bottas. Massa sets fast lap at 1m39.515 seconds. On lap 7 Hamilton sets fast lap at 1m39.293 seconds. The top four are slowly closing up on each other, while leaving the rest of the field behind. Williams reports that the two team mates should not be racing each other and should work to pull away from the Mercedes GP cars. Bottas reports that he has more pace, and takes a look at his team mate. Bottas says he can get by on the back straight. Vettel gets past Perez in eighth place. At lap 10 Massa leads Bottas by 0.5 seconds, followed by Hamilton (1.0s), Rosberg (1.8s), Hulkenberg (9.2s), Raikkonen (10.0s), Kvyat (10.7s), Vettel (11.5s), Perez (13.7s) and Ricciardo (15.1s) in tenth place. On lap 11 Rosberg sets fast lap at 1m39.197s. On lap 12 Ricciardo pits and switches to hard compound tyres. Sainz does the same on the next lap. On lap 14 Raikkonen pits for hard tyres. Massa runs a bit wide, but continues in the lead. Massas tyres are starting to wear out. Vettel pits on the next lap. On lap 15 Raikkonen, on new tyres sets fast lap at 1m38.954s. Ricciardo reports a lose of power. Vettel sets fast lap the next lap at 1m38.520s. On lap 17 Bottas closes up but is still unable to make the move on his team mate Massa. Alonso pits from 12th place, and changes back to medium compound tyres. Kvyat pits as well from 5th place. On lap 19 Hamilton pits from third place for hard comound tyres, the first of the leaders to pit. Hulkenberg pits as well. Raikkonen passes Ericsson. Vettel follows him through. Massa pits, Rosberg pits as well - the two come out side by side and Massa gets ahead, but behind Hamilton. Bottas pits the next lap, and rejoins just behind Massa. Rosberg and Bottas battle, and Bottas holds the position. At lap 21 Hamilton leads Massa by 3.3 seconds, followed by Bottas (4.2s), Rosberg (4.6s), Raikkonen (14.0s), Vettel (15.5s), Kvyat (17.0s), Hulkenberg (21.0s), and Ericsson (25.0s). On lap 24 Hamilton sets another fast lap at 1m37.187s. Mercedes GP reports that there is a threat of rain in the final half of the race. At lap 30 Hamilton continues to lead Massa by 5.3 seconds, followed by Bottas (6.6s), Rosberg (7.3s), Raikkonen (20.2s), Vettel (22.5s), Kvyat (25.6s), Hulkenberg (31.7s), Sainz (41.2s) and Perez (41.9s in tenth place. On lap 32 Sainz pulls off the track and grinds to a halt. The virtual safety car is deployed. Rain drops start falling on the track. The Toro Rosso is being removed from the track. The virtual safety car period ends and the race resumes. Light rain continues to fall. Bottas asks the team if he should stop for intermediate tyres. Drivers now report that the rain has stopped. Rosberg closes on Bottas, as the rain drops start again and cars are slipping around at certain points of the track. Vettl passes Raikkonen - Raikkonen pits for intermediate tyres - Ericsson, Alonso, Stevens and Merhi all pit. On lap lap 38 Rosberg passes Bottas for third place. Hamilton slides and goes off and then back on the track and continues. Mercedes GP reports to Hamilton that the rain shower has passed, but they think they will get more in five minutes. On lap 40 Rosberg attacks Massa and passes him for second place. At lap 41 Hamilton leadsRosberg by 5.7 seconds, followed by Massa (7.7s), Bottas (10.7s), Vettel (19.2s), Kvyat (19.8s), Hulkenberg (27.6s), Perez (55.6s), Raikkonen (56.6s) and Ericsson (1 lap) in tenth place. Rosberg is closing on Hamilton and is down to 3.7 seconds. Raikkonen is struggling and is passes by Perez. On lap 43 Hamilton pits from the lead and changes to intermediate tyres, just as the heavens open up and the rain comes down. Vettel pits as well. Hamilton catches Massa and passes him. Rosberg pits for intermediate tyres. Massa and Bottas both pit. Kvyat and Hulkenberg, and Perez pit. On lap 45 Hamilton leads from Rosberg, Vettel, Massa and Bottas. Bottas runs wide but continues. Hamilton leads his team mate by 9 seconds with five laps remaining. On lap 47 Raikkonen pits again for more intermediate tyres. At lap 50 Hamilton leads Rosberg by 11.3 seconds, followed by Vettel (26.6s), Massa (33.6s), Bottas (59.0s), Kvyat (66.1s), Hulkenberg (79.1s), Raikkonen (1 lap), Perez and Alonso in tenth place. Hamilton continues and takes the win at the checquered flag.